Many municipalities ban yard waste from standard solid waste pickup. Cities and towns that offer yard waste pickup services as a benefit to their residents often require branches and sticks to be bundled according to specifications to allow for easy removal by solid waste crews. Tying branches together in manageable bundles ensures they will not be left behind come yard waste pickup day. Bundle pruned branches for easy disposal. Measure the diameter of thick branches to ensure they comply with your community's size limitations. 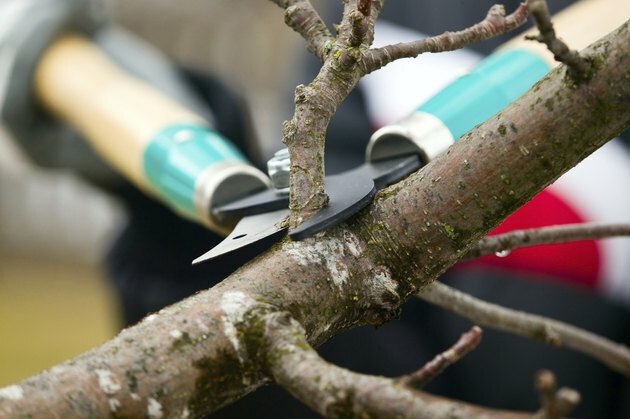 Cut branches to size according to the length limitations using a hand or pruning saw. Some municipalities, for example, may only accept branches under 4 inches in diameter and less than 4 feet in length. Cut lengths of twine using scissors to the length of your arm span and lay them parallel to each other on the ground, evenly spaced to the length of the branches. Stack the branches across the middle of the lengths of twine until a bundle no larger than you can hold in your arms has formed. This keeps bundles manageable and lightweight. Cities may have a weight limit on branch bundles. Draw the ends of one of the lengths of twine up around the bundle and double knot securely so the twine sits snug against the branches. Repeat with the remaining lengths of twine to hold the bundle together. Make sure bundles are knotted tightly so they don't fall apart when crews lift them. Connecticut-based Stacy Morgan began writing for eHow in 2009. Morgan graduated from the Porter and Chester Institute of Technology with a certification in architectural drafting. Why Don't Evergreens Lose Their Leaves?